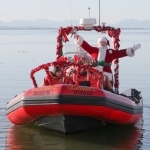 The Gulf of Georgia Cannery isn’t the only place in Steveston to get into a festive mood. Sunday November 28 really kicks off the season with the Merchant Association’s Christmas in Steveston Village. After you’ve taken pictures of your own little elves with Santa and enjoyed the Cannery’s Festival of Trees, take in a horse drawn carriage ride around town! Stick around long enough and you can even see the “magical lighting of the sequoia tree” in Fisherman’s Park in front of the Cannery.